“A spectacularly creepy and macabre tale” (Entertainment Weekly) of blackmail, murders both accidental and opportunistic, and of one life’s fateful unraveling—from Ruth Rendell, “one of the most remarkable novelists of her generation” (People), writing at her most mesmerizing. 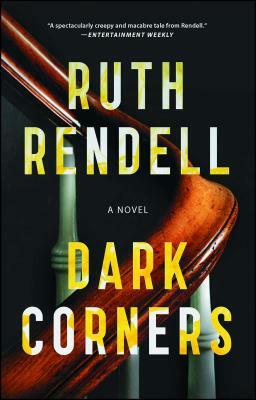 Rendell completed Dark Corners shortly before her death in 2015. When his father dies, Carl Martin inherits a house in an increasingly rich and trendy London neighborhood. Cash poor, Carl rents the upstairs room and kitchen to the first person he interviews, Dermot McKinnon. That is mistake number one. Mistake number two is keeping the bizarre collection of homeopathic and alternative “cures” that his father left in the medicine cabinet, including a stash of controversial diet pills. Mistake number three is selling fifty of those diet pills to a friend, who is then found dead. Dermot seizes a nefarious opportunity and begins to blackmail Carl, refusing to pay rent, and creepily invading Carl’s space. Ingeniously weaving together two storylines that finally merge in a shocking turn, Ruth Rendell describes one man’s spiral into darkness—and murder—as he falls victim to a diabolical foe he cannot escape. This is brilliant psychological suspense that gets under your skin. As Stephen King says, “No one surpasses Ruth Rendell when it comes to stories of obsession, instability, and malignant coincidence.” Dark Corners, her last book, “ranks among her best” (The Washington Post). Ruth Rendell (1930–2015) won three Edgar Awards, the highest accolade from Mystery Writers of America, as well as four Gold Daggers and a Diamond Dagger for outstanding contribution to the genre from England’s prestigious Crime Writ­ers’ Association. Her remarkable career spanned a half century, with more than sixty books published. A member of the House of Lords, she was one of the great literary figures of our time. "A worthy addition to the canon... Rendell once again exhumes the depths of obsession and traces each step in a sympathetic character's downward spiral. It has both a mythic element--all the trouble starts with a box that shouldn't have been opened--and a Victorian bent, in that it features an inheritance that dooms the recipient... This is stunningly suspenseful and often downright creepy." "A spectacularly creepy and macabre tale from Rendell." “With DARK CORNERS, Rendell, who perfected the art of the truly suspenseful, psychological thriller, clearly had one final trick of drawn-out intensity up her sleeve… Rendell’s delicious, quasi tongue-in-cheek atmosphere is so finely-tuned and tightly wound that it manages to be menacing and mesmerizing while harboring a nearly over-the-top element of the melodramatic.… The book inspires a perpetual niggling level of anxiety, the persistent white noise of tension and jittery energy that Rendell honed to bone-cutting sharpness over her long and celebrated career… Meanwhile, she incorporates tart, amusing, and canny observations on the current state of everything from the challenge of grown children moving in with parents — or, in some cases, never leaving — to the lack of affordable housing in London, the presence of random violence, Cones of Shame on pets. From the creepiness of a character who relishes causing fear in others, to the surprising ways in which a football-size pottery goose can come in handy, DARK CORNERS proves that Rendell never lost her touch." "Ruth Rendell was one of the finest writers of the 20th century."